WIN2019 The 27th International Workshop on Weak Interactions and Neutrinos. WIN2019. The 27th International Workshop on Weak Interactions and Neutrinos. The International Workshop on Weak Interactions and Neutrinos has a history of more than 40 years and took place in Africa, Asia, Europe, North America, Oceania and South America. 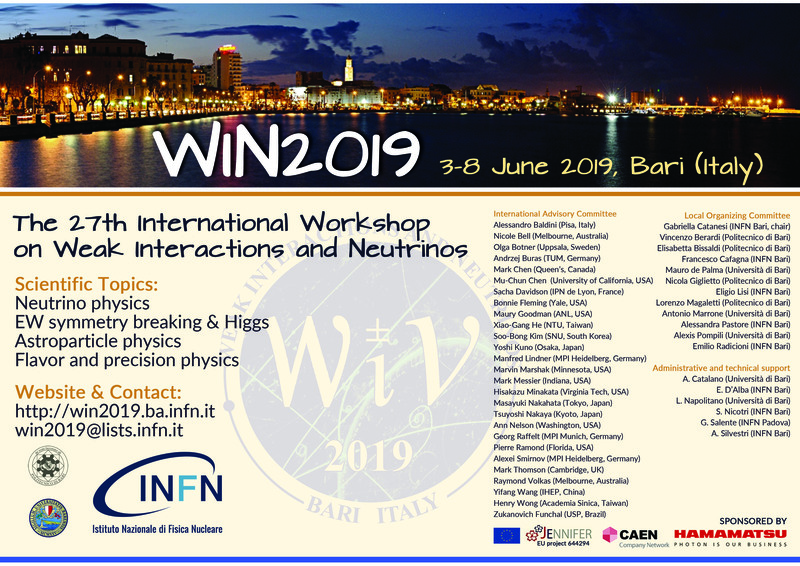 The 27th edition of the International Workshop on Weak interactions and Neutrinos (WIN2019) will be held in Bari, from June 3-8, 2019. The purpose of the Workshop is to offer to the community a significant opportunity to assess the status of the field and to initiate collaborative efforts to address current physics questions.